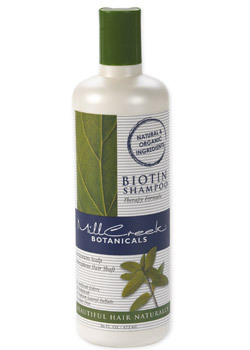 This shampoo contains the key ingredient Biotin, which is known as a super supplement for your hair. Used daily, the enriched formula can help replenish important nutrients necessary for a healthy scalp and hair. This therapy formula also combines other B-complex vitamins (panthenol, inositol, niacin, folic acid andcystine) with hair rejuvenating proteins and herbs like keratin, jojoba and aloe verafor healthy-looking hair with full-bodied texture. Refreshing peppermint oil provides an invigorating sensation while stimulating the scalp for optimum results. Deionized Water, Biotin, Hydrolyzed Keratin, Peppermint Oil, Hydrolyzed Elastin, Niacin, Folic Acid, Panthenol (Provitamin B5), Organic Aloe Vera Gel, Organic Essential Oil, Jojoba Oil, Inositol, Barley Extract, Sodium Myreth Sulfate, Cocamidopropyl Betaine (Coconut Oil), Octyl Dimethyl Paba, Styrene/Acrylates Copolymer, Citric Acid, Potassium Sorbate, Sodium Benzoate, Botanical Fragrance. Warnings For external use only.